The drawing below represents the ballroom divided into three spaces. In each room, the DMX control console outputs DMX only to the outlets in that room. No console can address the DMX channels outside of its room. Each room has its own dedicated DMX universe(s). Architectural house lights can be controlled from the console. Architectural lighting loads are mapped to easily remembered DMX channels. The drawing below represents the ballroom in its fully open configuration. In this configuration the DMX control console outputs DMX to every outlet in the entire space. Architectural house lights can be controlled from the console. 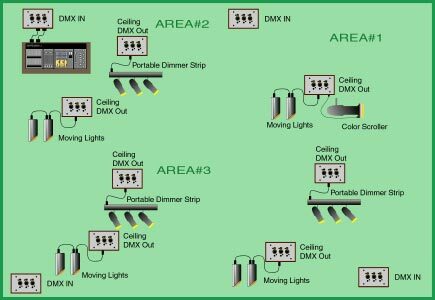 Architectural lighting loads are mapped to easily remembered DMX channels. In the fully open configuration, the system provides a Virtual Rooms feature. In the standard architectural room combine systems, when the rooms are combined, you lose control of the separate rooms. 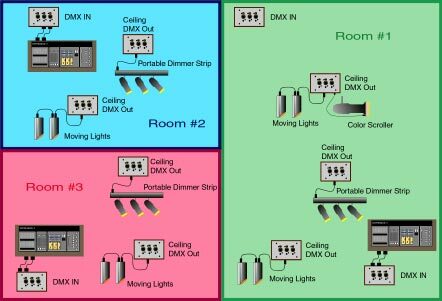 In the EN DMX Room Combine System, when rooms are combined , the rooms become areas within the greater room. Discreet control of the architectural lighting within each area is maintained. For instance in a banquet setting the food service areas can be brightly lit while the lighting levels in the seating area can be set at lower levels. Multiple consoles, one per DMX universe, may be used simultaneously within the system, i.e. console #1 can control architectural loads and dimmers, while another console programs and controls moving lights. This feature is available at any location, at any DMX input jack. Back to Room Combine System Information.